As we were planning the Opening of our cattery, the most important phase after selectionning our fondation lines, was to find an appropriate name for it. 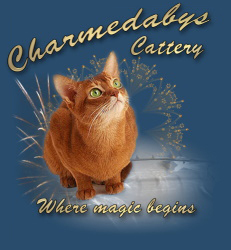 But how describe the attraction for this mysterious and magic being that is the Abyssinian and at this point in time, came to us the name Charmed, it is synonymous to magic, attraction, a being whose pace and charm make him a quasi magical being and we add abys for Abyssinian of course. 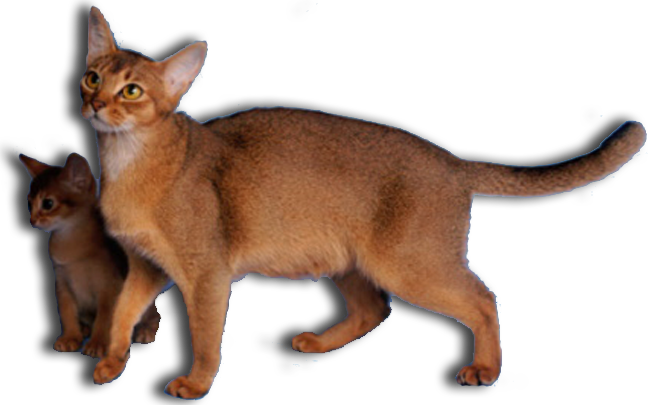 Our love for Abyssinians, began with a little girl named Hera, our first aby, After that we couldnt imagine our lives without an aby. Then as we were searching for the perfec cinnamon aby, we discovered Gecco Aus Abusir in a small cattery in Munich, Italy, called Solarian. A great friendship began with his breeder Chiara Parodi who have been a great menthor and is always there for us at any time. She gave us the chance to open our own cattery by agreeing to let us adopt her foundation cats, Uganda and Mercury. In order to find a perfect girlfriend for our boy Red Flame, from Nightmist in Sooke BC, we had then contact many breeders to see if they met the criterias we had for our cattery�: Pkdef negative, PRA negative and checked for Patellar Luxation, FIV, Felv and PIF negative in order to give our kittens the best possible departure in life. Thanks to our menthor, Chiara Parodi, we came in contact with Joana Beck from Saltvig cattery, where we adopted our little Spicy Chiara, the daughter of Mistral, the son of our Gecco Aus Abusir and our daughter Uganda Aus Abusir. We make a point about thanking all thoses wonderful breeders who surrounded us with friendship and menthoring, they help us achieve our dream !